This is what happens when you prioritize big action set pieces above everything else. The World Is Not Enough is about oil magnates chasing after a nuclear bomb they want to use to destroy their biggest competitor, but if you blink at the wrong time, or your cats run into the room, or there's a strange noise outside, or you discover that the lint cluster forming in the bottom of your pocket is more fascinating than the multi-million-dollar blockbuster on your TV screen, you could miss the only scene where this plot is at all relevant. There's nothing profoundly wrong with the film, it's just that the plot is never more than an excuse to set up action scenes, and those action scenes are never more than big guns and bigger explosions. One of the few things the movie has going for it is that it never once asks to be taken seriously. Not only is it filled with dumb one-liners, the villain is a man slowly dying because the bullet from an old gunshot wound is still moving through his brain (making him invincible because science). Bond ends up driving Q Branch's latest high-tech, jet-propelled boat onto dry land and through the streets of London (streets that, it should be mentioned, have water right next to them). He crashes through countless storefronts and residences, and all this wanton destruction is in the pursuit of a lead he knows nothing about and who would have only led him to a red herring anyway. The action is so flat and meaningless that the only thing enjoyable about it is the laughably excessive performance from Pierce Brosnan. 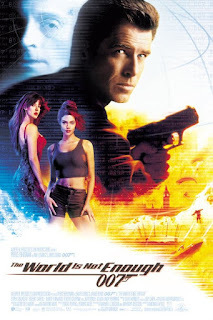 And speaking of Brosnan, if I were him I would avoid putting anything from this entire film on a demo reel (not that he would ever need one, of course, but you know what I mean). Everything he does is so consistently overacted that I can only imagine director Michael Apted standing off-screen asking him to do whatever he just did bigger. If you made a supercut of all the stupid faces he makes here (particularly when gasping for air), it would be far more entertaining than actually watching the movie itself. You know something's wrong when Denise Richards playing a nuclear physicist isn't the most out of character element in your movie. If The World Is Not Enough has one redeeming quality aside from Brosnan's ridiculous faces (and I'm not entirely certain that it does), it's the plethora of silly gadgets. Beyond Q's vacation boat, there's a fancy new car, an anti-avalanche jacket, a credit card lock pick, a pair of x-ray eye glasses, a decoy exploding pistol, a walking cane gun, and some hilariously awesome parachuting snowmobiles with giant propulsion fans on the back of them. The film is like a tribute to Q Branch, which is fitting since it's Desmond Llewelyn's final role in the series. Along with John Cleese as the replacement Q, this isn't the worst send-off the franchise could have given him. But overall it's just not good. It's so loud and explodey that if you don't mind how empty it all is you can get from start to finish easily enough, but it's so unfulfilling I can't imagine why anyone would want to. There are a few truly awful moments, like when Bond kills someone because they challenge his masculinity, but these are admittedly in the minority. It's not a total disaster, but it has so little going for it that I have a hard time understanding how Bond went from GoldenEye and Tomorrow Never Dies (two of my favorites) to this nonsense.